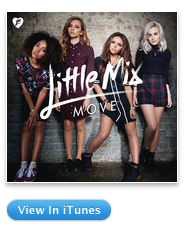 Move, the first single of Little Mix’s second studio album Salute has dropped like a bombshell. The video was released this morning and let me tell you, it definitely helps that feel-good Friday feeling! The video sees the girls giving it absolute socks while dancing with their (hot) backing dancers in a box-shaped room and in a warehouse. The girls’ clothes are stunning right the way through the video and the girls reportedly used their own makeup from their line with Collection. The band don’t stray from their previous videos with the box-shaped room making a comeback after How You Doin’ and the warehouse splashing back onto the screen after their very first single, Wings!